If you think regular deviled eggs are great, these spicy bacon deviled eggs are the bomb! They have a kick from the heat, and smokiness from the bacon and are really fast to put together. I am a huge fan of deviled eggs and that’s the only way I can eat boiled eggs. I need that yolk to be spiced up and creamy and have flavours. Which is exactly what we are doing here. We’ve amped up our regular deviled eggs and added cream cheese, bacon bits and a super spicy hot sauce from Bira to make a combination thats going to blow your mind. If you think deviled eggs are only an easter thing, you guys really need to change your appetizer game. I serve these almost every time we have friends over. And everybody who has eaten these falls in love. 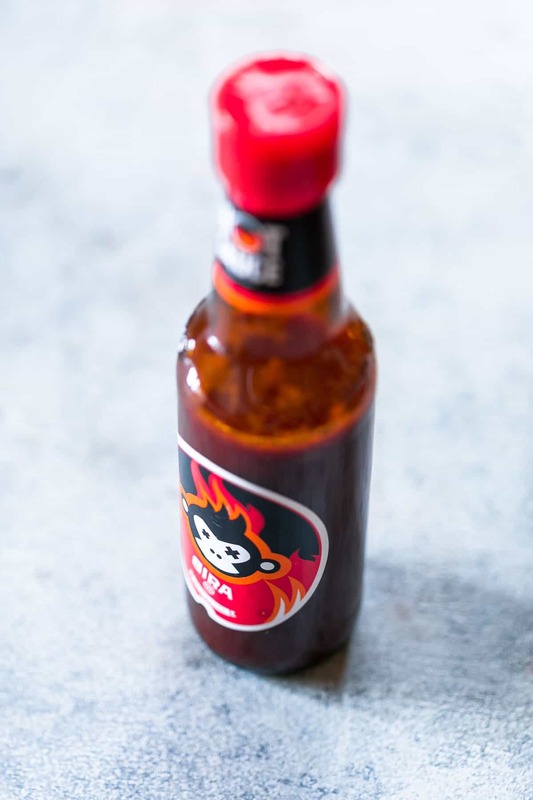 Lets just take a minute to talk about Bira’s new hot sauce because here’s a sauce that definitely takes heat to different levels. It’s got just the right balance of heat and acidity. I’ve been slathering it on toast, eating it with crackers, and obviously using it in these spicy bacon deviled eggs. A little definitely goes a long way. Like a lot of other hot sauces, this one isn’t on the sweeter side and really packs a punch. I made these spicy bacon deviled eggs so many times while testing this recipe to make it absolutely perfect for you that now I know a thing or two about deviled eggs. I usually end up boiling the eggs the previous day, and then mixing everything up on the day of the party. 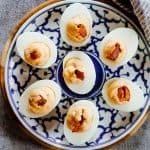 If you’ve never tried deviled eggs before, or think they are boring, try these amped up spicy bacon deviled eggs and you’ll change your mind fosure! 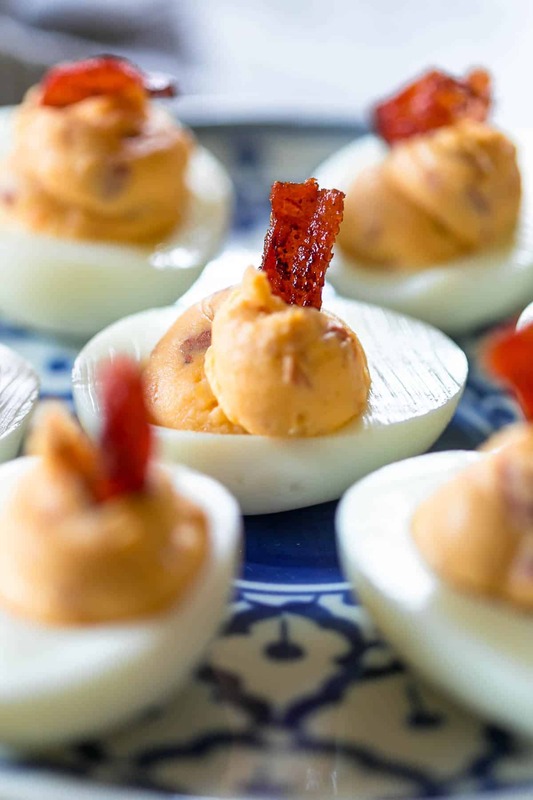 If you think regular deviled eggs are great, these spicy bacon deviled eggs are the bomb! They have a kick from the heat, and smokiness from the bacon and are really fast to put together. Watch Recipe Video ABOVE. Boil Eggs: Place eggs in a pot and fill with water till the water covers the eggs. Bring them to a boil and as soon as the water starts boiling, turn off the flame. Cover the pot for 10 minutes for hard boiled eggs. Once 10 minutes are up, ladle the eggs out and place them in ice cold water. This stops them from cooking further. Once completely cool, peel the eggs and set aside. Bacon: Cook the bacon strips till lightly crispy. Take them off the pan and chop them into small pieces when cool. Filling: To make the filling, cut each egg in half lengthwise and scoop out the the yolk in a bowl. Add dijon mustard, mayonnaise, cream cheese, Bira’s hot sauce and pepper to the boil. Whisk till completely smooth and add the bacon, reserving a few pieces of bacon for topping. Mix well. Assembling: To assemble the deviled eggs, spoon the filling into a piping bag and cut off the end. Pipe the filling on top of each egg. Add more bacon bits on top. 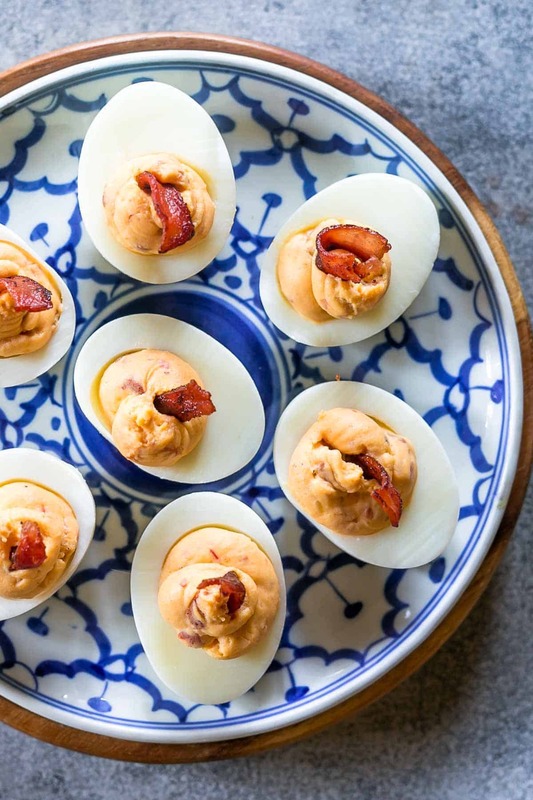 These spicy bacon deviled eggs can be refrigerated in an air tight container for up to 3 days, but taste best when served immediately. Absolutely love this recipe. Can’t wait to make it again!